Conflict prevention and crisis management has become a key activity for the EU since the creation of the Common Security and Defence Policy in 1999. The rapid growth of this policy area, as well as the number of missions deployed beyond the EU’s border raise important questions about the nature of the EU’s international role and its contribution to international security. 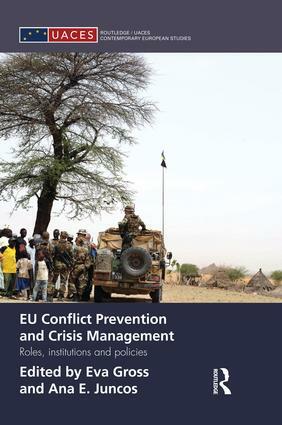 The Contributions to EU Conflict Prevention and Crisis Management analyze European conflict prevention and crisis management in terms of the EU’s evolving global role, its institutions and its policies. The volume analyzes the EU’s position in relation to the US, the UN and other regional security organizations, and applies three different institutionalist perspectives – historical, rational choice and sociological institutionalism - to explain the increasing institutionalization of EU crisis management. It also critically analyzes the application of EU policies in West Africa, Afghanistan and the Caucasus. Providing a comprehensive analysis of EU crisis management, the volume explores what role EU conflict prevention and crisis management plays in a European and a global context. Offering a comprehensive and original contribution to the literature on EU foreign and security policy, this volume will be of interest to students and scholars of European politics, international relations and security studies. Eva Gross is Senior Research Fellow at the Institute for European Studies, Vrije Universiteit Brussel and a visiting lecturer at the University of Kent: Brussels School of International Studies. Research interests include the role of the EU as a global actor, the Europeanization of national foreign and security policy, transatlantic relations and EU conflict prevention and crisis management policies. She holds a PhD from the London School of Economics and has been a visiting fellow at the Centre for European Policy Studies (CEPS) in Brussels and the EU Institute for Security Studies (EUISS) and CERI Science Po, both in Paris. Ana E. Juncos is Lecturer in European Politics in the School of Sociology, Politics and International Studies at the University of Bristol. She holds a PhD in Politics, International Relations and European Studies from Loughborough University, where she is currently a Teaching Fellow. Her doctoral research, partly funded by Riksbankens Jubileumsfond through the ‘European Foreign and Security Policy Studies Programme’, focused on the coherence and effectiveness of the EU’s Foreign and Security Policy in Bosnia (1991-2006). Previously, she won a scholarship at the Spanish National Council for Scientific Research and worked as a research assistant at the University of Ottawa (Canada). She holds a degree in Political Science and Public Management (University Complutense of Madrid) and a European Humanities Diploma (Université Sorbonne Nouvelle, Paris).